Feeding your Shih Tzu has become very complicated now-a-days with so many choices. Most Shih tzu owners are concerned about providing a high quality healthy diet. It seems that everyone has an opinion on this subject today. Should I feed dry kibble, semi-moist or canned dog food? Should I prepare homemade dinners for my dog or provide a commercially prepared raw diet? Should I choose one type and stick to it or rotate foods? 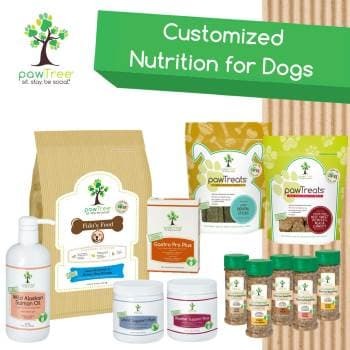 Do I need a dog food diet that includes premium, holistic brands, or those that are all natural or organic? Will I even be able to afford those high priced diets? The debate rages on and proponents of one type of food over another can make you feel less than human if you don't take their recommendations. What to do? 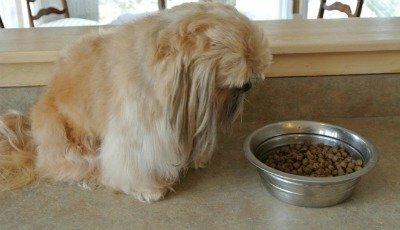 Feeding Your Shih Tzu doesn't have to be complicated. Let's break it down into bite size pieces. There are so many choices that it makes deciding on a good healthy, affordable diet a challenge. That is only a start. It often feels as though one must have a PhD in chemistry to decipher pet food labels. Moreover, understanding the difference between good, better, and best ingredients requires one to pursue a PhD in Canine Nutrition. For the average pet owner who wants to provide a good quality dietary experience for their dog, the choices often become insurmountable. Luckily, many people are learning more about nutrition, for themselves and are then using this knowledge to make informed decisions about their pets. 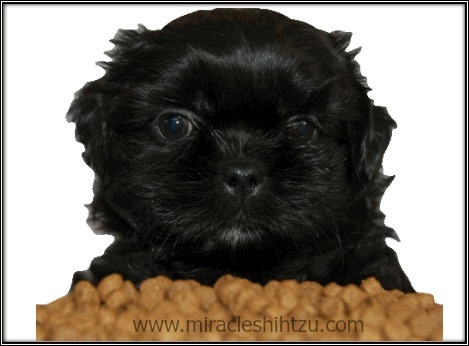 Feeding your shih Tzu doesn't have to be a insurmountable task. Let's break it down into steps. Dog food manufacturers have responded by improving their products. Some companies who may have offered lower quality in the past are improving their lines. Although reassuring, it is still a monumental challenge to walk into a pet store, grocery store and stare at four isles of different brands of dog food knowing that there are even more choices online. What is the average pet owner to do? We had this dilemma and started a little research on our own. These are some of the questions we asked? Do dogs have the same nutritional requirements as you or I? The answer is yes and no. Dogs have unique requirements and many of the foods we eat are very dangerous to your dog, even lethal. Dogs are considered carnivores but their early ancestors were also scavengers. As such, they would devour the entire carcass of the animal including the stomach contents, which contained vegetable and fruit matter. Today’s commercial foods reflect this heritage with protein sources that include meat and fish as well as vegetables and fruits. All dogs require Proteins, Fats, Carbohydrates, Vitamins, Minerals, and plenty of fresh water. Depending on the quality of the food, there are many different sources for each of these nutrients. Good sources of protein include meat and fish, or concentrated versions of meats such as chicken meal. Poor quality foods use protein fillers such as corn gluten meal. Good sources of fats include named fats such as herring oil or chicken fat. Poorer quality foods contain non-specific sources such as vegetable oils and synthetic preservatives such as BHA and BHT. Carbohydrates come in the form of whole grains, fruits, and vegetables in high quality foods. Poor quality foods will contain highly processed flours and grain remnants. When it comes to feeding your Shih Tzu, these poorer quality fillers are often the culprit of many of the allergies suffered by this breed. People are always asking how much food should a Shih Tzu eat. The quantity of food you feed your Tzu depends on several factors: Age, Activity Level, Health Status, and Overall Size/Bone Structure. Puppies need foods that provide plenty of protein, vitamins and minerals, however, they can't consume much at any one meal. Small (or tiny) meals can be provided spaced throughout the day. Three meals is usually a good number until the puppy reaches four to five months, and then you can cut back to two meals daily. Very active Shih Tzu dogs and those that are involved in canine sports such as agility will need more calories than most and should be provided with a high quality food that gives them optimal nutrition. If your Shih Tzu is suffering from an illness, your vet is the best resource for information about diet. There are many different prescription diets that a Shih Tzu may be placed on depending on his health status. Finally, a Tzu's bone structure and size will also dictate how many calories to feed. The normal weight of a Shih Tzu is 9 to 16 pounds, but many puppies are being bred to be much smaller. It goes without saying that a four pound Shih Tzu is not going to consume the calories of a 16 pounder. The tiny 3 or 4 pound Tzu may seem to eat very little but still be very healthy. You can find a feeding chart at Lovejoys that will give you an idea about the quantity of food to feed. This has become a hotly debated subject recently. 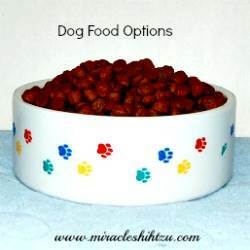 Many people are advocating for home cooked meals for their dog declaring this as the easiest, healthiest way to provide a good Shih Tzu diet. By cooking it yourself, you are fully aware of what ingredients you are using and have complete control over the freshness and wholesomeness of those foods you provide. One must understand the science of canine nutrition to do this properly, so simply giving your dog your table scraps will not provide all the nutrition that the dog needs. 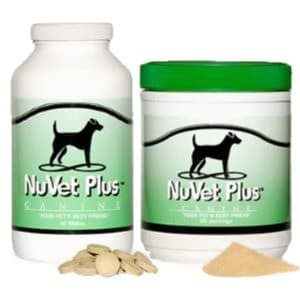 If you are on the other side of the debate, you like many of us simply do not have the time to devote to the study of nutritional needs of Canis lupis familiaris and would prefer for the experts to put together the diet that best meets our fur babies’ needs. Are you one of those people who feel overwhelmed with the number of dog food choices on the market today? Well, I am. We have a choice between dry, canned, frozen, freeze-dried, semi-moist, raw, refrigerated, etc. etc. Sometimes it is a matter of our convenience. Sometimes it is all about the taste buds of our canine friends. Sometimes it is a matter of finding the perfect food that meets our pet's needs. Dog foods are all different, ranging from the highest quality to those that offer little in the way of nutrition at all. Labels can be so confusing, but you can become an expert in no time by reading a few simple tips on what to look for in the order and way of ingredients. Fortunately you don’t need to understand every word but you should be aware of what you are putting in your little Shih Tzu’s stomach There are a few key sections on a label that you can use to help decide on a particular product. These sections include the product’s name, the ingredients, the guaranteed analysis, the nutritional adequacy statement, and the feeding guidelines. It is beyond the scope of this article to go into details about food labels. In the next article, we will delve into a few quick tricks to help you understand just what is going into your favorite canine’s mouth. Should you feed a meal or let your puppy snack all day? There are those that suggest the best way to train your dog is to put him on a schedule of predetermined meal times. This method teaches the dog that you are the alpha member of the pack and that you and only you provide his sustenance. This method also helps with house training as it provides a consistent means for you to schedule outdoor walks. Those that use this method will provide three meals a day for very young puppies, reducing it to two meals, as they get older, and even one meal as adults. On the other hand, some prefer to provide food throughout the day—free feed. This method works better for busy families who may not always be available at the same time each day to feed the dog, creating inconsistencies in his schedule. It is also hard on small breed dogs, such as the Shih Tzu, Yorkie, or Maltese, because they are prone to hypoglycemia, which can be treated if caught early. It can also be fatal if the dog does not eat within a relatively short period. 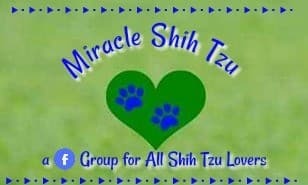 So if you know that you won't always be available due to games or school events, feeding your Shih Tzu on this type of regime might be the answer. If you just want a quick overview of some of the many things to consider when choosing a dog food, this article is for you. 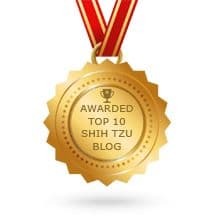 Guest Author, Roy Emerson points out some very bad ingredients that you should avoid and adds some additional tips that will help make you a more informed Shih Tzu owner. There's always room for treats, or is there? With so many of pets in the U.S. are overweight or obese, some Shih Tzu owners hesitate to provide treats for the furbabies. Others, go , well, overboard. What is the best way to use treats in your daily living. Even more importantly, how do you choose healthy, nutritious treats that your Tzu will love? There are many excellent fruits and vegetables that are not only good for you but for your Shih Tzu as well. Better yet, they are chocked full of nutrients like vitamins, minerals, and antioxidants. Best of all, they are low in calories which make them a good choice especially if your Shih Tzu is watching her waistline. 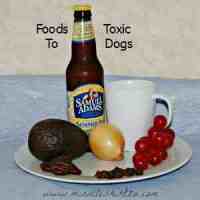 But, dogs can not eat all fruits and vegetables and some are downright toxic to them. Learn about the benefits of these special treats and discover which ones to avoid. There are some foods that dogs should never eat. Some can be very toxic. Like all breeds, Shih Tzu dogs can have problems when it comes to meal time. Some eat too much and others are too picky. Some dogs have allergy problems and others will eat anything, including their poop! To make it more complicated, not everything you love to eat will love your dog, so you need to steer clear of any foods that dogs can't eat. Knowing how to prevent them is the easiest route to take, but what if you have a dog that develops problems as they age? Obesity is a major problem in Shih Tzu as they age, especially those that have become lazy over the years and do not receive their daily dose of exercise. Some Shih Tzu dogs are just more active than others, but as they age, most slow down to some extent. Finding the right product, feeding your Shih Tzu the correct amounts, and limiting extra treats and snacks and providing daily exercise is one way to avoid obesity problems. Some breeds such as Shih Tzu dogs are also prone to food allergies that often show up as skin irritations, scratching, and hair loss. Does your dog have allergies? At least a fourth of all Shih Tzu have some type of allergy. These dogs could be allergic to one or more ingredient in the food or they could be sensitive to some contaminant that creeps into the food during the manufacturing process. The only real way to know is to put the dog on an elimination diet under the care of your veterinarian. If your dog is Scratching, he may have a food allergy. Shih Tzu dogs seem to have peculiar eating preferences. One very common issue that some of these dogs have is that of eating their own or others feces, called coprophagia. This is a nasty habit but it will not hurt your dog. Puppy-hood is usually when it originates. The mother dog must keep the puppies clean and thus licks them to stimulate urination and defecation. Puppies watch and learn from their mother. The best method is simply to get the feces up before the dog has a chance to get it. If that is not possible, there are products on the market that help with the habit or some prefer to try homemade remedies.